NEWARK, N.J. -- Gov. Chris Christie could be forgiven if he had chips on both shoulders as big as those shoulders. This year, the first of his second term, has been overshadowed by often partisan investigations, more protracted than productive, of the involvement of several of his former aides -- he fired them -- in the closing of some access lanes to the George Washington Bridge. Nevertheless, Christie today radiates serenity. His critics, including many Hillary Clinton enthusiasts, hoped the last 12 months would be for him a terrible, horrible, no good, very bad year. He has, however, thrived. He won two elections last November. One was for a second term as governor, in which he received 60 percent of the vote, including 57 percent of women, 51 percent of Hispanics and 21 percent of African-Americans. The other election -- which was, in its way, harder fought; his rivals included other potential presidential aspirants -- was to become chairman of the Republican Governors Association. In this capacity, Christie has been crisscrossing the country, campaigning for and distributing contributions to Republican gubernatorial candidates. And campaigning for other Republicans. He carried over into this year $50 million the RGA had in its coffers; he has presided over the raising of at least another $50 million; by Nov. 4 he will have perhaps raised upward of another $10 million. By then he will have been in more than 30 states in 11 months. 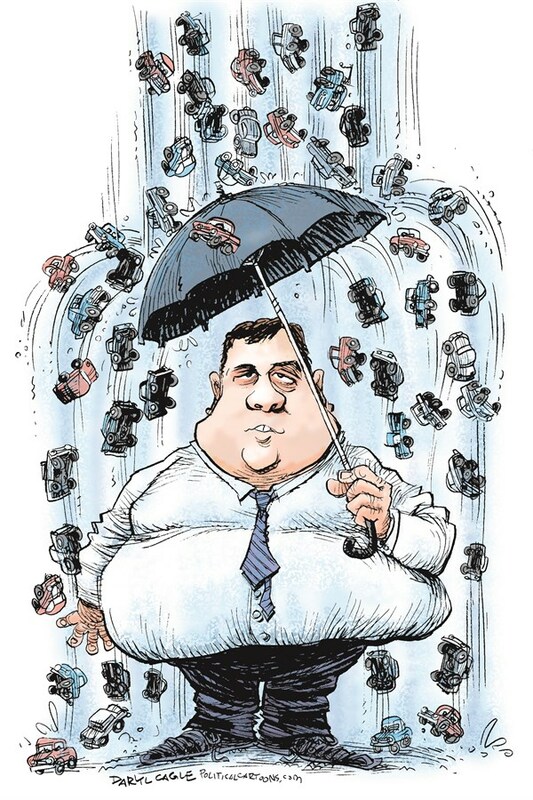 Coyness is not in Christie's repertoire, so regarding his 2016 intentions he says he will decide in 2015 and meanwhile will not disguise the obvious -- that he is doing spade work that prepares the ground for a possible presidential run. Republicans must ask each potential nominee: What brick can you remove from the Blue Wall? It is built from the 18 states and the District of Columbia, jurisdictions that have voted Democratic in at least six consecutive presidential elections and have, together, 242 electoral votes. To sharpen the question: Who can take his persona and message to, say, Philadelphia's suburbs? In a sense, Christie already has, twice. Running for governor required advertising on Philadelphia television. He is a pro-life governor elected twice in a deep blue state to which he has delivered $2.35 billion in tax cuts, and in which the government budget is now less in real dollars than it was in fiscal 2008. To those who fault him for his positions on this or that, he amiably says: "If you're looking for someone you agree with 100 percent of the time, go home and look in the mirror, because you're it." And, he adds, if someone says he agrees with you completely, "He's lying." He may, however, have taken a judicious step toward accommodating one passion of the Republican nominating electorate. In July, he established a commission "to review the effectiveness" of New Jersey's student assessments, "including the Common Core State Standards." This could be a means of stepping away from the Common Core, support for which will be a huge impediment for any Republican aspirant. When asked whether he might be a wine that will not travel -- whether his occasional pugnacity might not play nationwide, or seem presidential -- he laughs, noting that during his recent trip to Mexico, members of the media traveling with him seemed puzzled by his sedate, diplomatic manner. He asked them, "Do you think I have only one [golf] club, a driver, in my bag?" During a 2008 Democratic candidates debate, Barack Obama said icily, "You're likable enough, Hillary." He is not so much anymore. Is she? Christie's strength against her might be the variable that most explains most presidential elections: likability. Also, Americans often elect presidents who conspicuously lack the perceived defect of the preceding president (e.g., Jack Kennedy's youth contrasting with Dwight Eisenhower's age, Ronald Reagan's strength correcting for Jimmy Carter's weakness). Christie, who exudes executive authority, is the antithesis of today's bewildered incumbent floundering from the disappearing red line regarding Syria, to the HealthCare.gov debacle, to the Veterans Affairs scandals, to the no-one-tells-me-anything surprise about the Islamic State, to the Secret Service that cannot lock the White House's front door. Christie the zestful political combatant is also, and first, a father, with two of his four children, 14 and 11, at home. This will influence his decision about 2016. But so, he says, will this: His wife, Mary Pat, does not want him sitting in the backyard, years hence, harboring regrets about a road not taken.